Begin by speaking to Thormac the Wizard in the Sorcerer's Tower south of Seers' Village. Firstly, speak to Thormac the Wizard in the Sorcerer's Tower located south of the Seer's Village. It seems that he has lost all 3 of his Scorpions and would like your help to get them back. 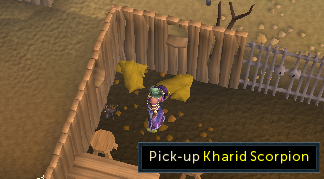 He tells you to speak to a Seer in the Seer's Village to the north to help you locate them, and he also gives you a Scorpion Cage to assist with catching them. Speak to a Seer, who will tell you that the first Scorpion is near some nasty Spiders and 2 Coffins. You can find it deep in the dungeon south of Taverley. 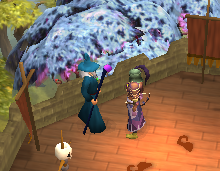 Be sure to bring your Dusty Key, Antipoison Potion, Dragonfire Shield, food, and maybe some Runes to teleport if you need to. Note: You must speak to a Seer first; otherwise you will be unable to capture this scorpion! To get a Dusty Key, head into the Taverley Dungeon and follow along the passageway, past the Animated Axes, Hill Giants and Poison Scorpions until you find a room that looks like an underground Black Knight Fortress. When in the largest room take a left and kill the level 56 Jailer to get a Jail Key. Open the nearby cell door and talk to Velrak the Explorer to get a Dusty Key. Now go back to the cavern with Poison Scorpions and Chaos Dwarves. Head past the Lesser Demons and open the gate with the Dusty Key. Dart past the Blue Dragons (you should be fine without a Dragonfire shield as long as you don't attack the dragons) and Black Demons until you get to the Poison Spiders. 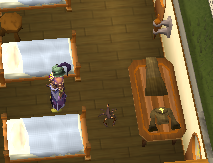 You should now be able to see a tiny Scorpion in a small room. 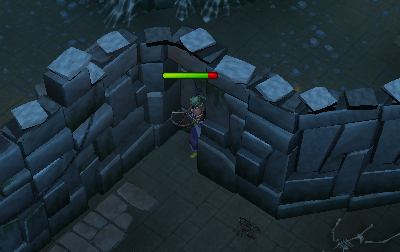 Search the Old Wall to push it open, collect the Scorpion with the Scorpion Cage and then teleport or walk out of the dungeon. It looks like it's time to go to the Barbarian Outpost located northeast of the Tree Gnome Stronghold. 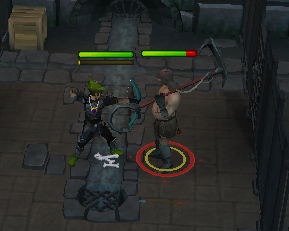 If you have never been here before, the Guard will stop you and ask you to do the Alfred Grimhand Barcrawl to prove that you're a true Barbarian. To complete the Barcrawl, you just need to buy a special drink from 10 different bars around RuneScape and drink it. You'll need about 300gp to pay for all of the alcoholic beverages to complete the Barcrawl. For more info on the specific bars, check out the Alfred Grimhand Barcrawl guide. Once you've completed the Barcrawl, bring your Barcrawl Card back to the Guard and he will let you inside of the outpost. The Scorpion is in a room right across from the entrance. This one is located in the upper floor of the Monastery and is the easiest one to get, as long as you can get into the guild! Keep in mind that you must have at least level 31 Prayer to get up the ladder to the second level of the Monastery the Scorpion should be crawling around near the ladder. 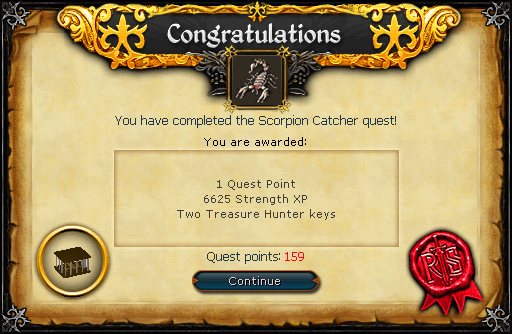 After you catch the final Scorpion head back to the Sorcerer's' Tower and Speak to Thormac to complete the quest.